Behold the new face of international diplomacy and its many piercings. Yes, the unlikeliest statesman since Silvio Berlusconi, has lent his intellectual and sartorial weight to one of the international community’s thorniest problems – North Korea. Meet Dennis Rodman – ambassador extraordinaire. The flamboyant basketball legend who is in an all star league of his own when it comes to the bizarre has just returned from an unsolicited mission to North Korea. Taking straight to the airwaves with his eloquent plea for mutual understanding, Rodman appeared on ABC’s ‘This Week on Sunday’ to chat about his visit to Pyongyang with host and former Clinton aide, George Stephanopoulos. Conservative hackles were already well up after pictures predictably snapped by the North Korean ‘media’ went viral with Diplomacy Dennis and the World’s Sexiest Man, Kim Jong Un chuckling away and generally revelling in Pyongyang palace life. 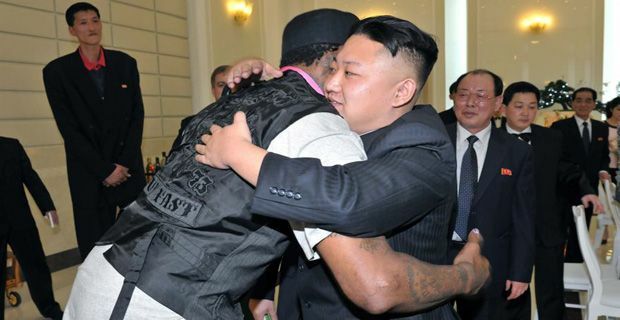 "He's a great guy," said Rodman of Kim. "I love him. He's awesome,"
When it was pointed out to the self appointed emissary of peace that he might be awesome in much the same way as Stalin, Rodman replied "You know, he's a good guy to me. Guess what? He's my friend. I don't condone what he does … [but] as a person to person – he's my friend,"
"He wants Obama to do one thing: call him. He said: 'If you can, Dennis – I don't want [to] do war. I don't want to do war.' He said that to me." "[Kim] loves basketball. And I said the same thing, I said: 'Obama loves basketball.' Let's start there." To be honest – it’s easy to laugh at Rodman and mock his political naiveté , but you know what – why don’t they just start with some common ground, however trivial and tenuous and work from there. Do hundreds of apparatchiks on both sides really need to be involved? Should international diplomacy really so removed from human experience and be so drastically weighed down by endless layers of bureaucracy?